The worlds energy demand will over the next 20-30 years be about 30 percent higher in 2040 compared to 2010. All prognosis forecasts that Oil and Gas, will continue to provide the majority of the demand. The new demand comes mainly from the non OECD countries, where the energy demand will grow by close to 60 %. Meeting energy needs over time – safely and with minimal environmental impact, is vital, and computational capabilities are a big part of those efforts. For example, new imaging techniques are required to find oil and gas deposits in complex geological areas. More complex and higher fidelity modeling of reservoirs are needed in order to extract the maximum resources from the prospects. Real time well placement using complex 3D modeling of extended horizontal wells will be necessary in order to access resources and it will enable access to resources with minimal environmental footprint. The first part of this talk gives an overview of the business and geopolitical drives of the industry, followed with the critical contribution of computation in the quest for secure supply of energy. There is no denying the need for storage. Digital data continues to grow at explosive rates driven by macro themes including: Cloud, Social Media, Tablets, Increased Bandwidth, Data Analytics & Technical Computing. The pace of user generated content and the fire hose of information availability puts market statistics out of date quickly. IDC estimates that 70% of the “Digital Universe” is created by consumers; however, enterprises are liable for managing 80% of the data of which a significant portion is stored on disk drives. The insatiable appetite for online data continues to grow about 50% year over year (IDC). Web browsing, audio/video streaming and a variety of other applications are driving bandwidth consumption from fixed and mobile devices. The proliferation of tablets and smart phones shipments has now exceeded that of PC’s and this trend will not reverse. The build out of cloud environments is forecasted to be over $200 billion in 2020. Big Data Analytics is expected to reach ~$17 billion in 2015. 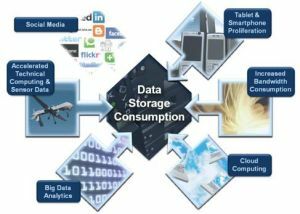 Social media has significant influence on data storage consumption as it drives applications connected to mobile devices, cloud, and often times requires increased bandwidth. Technical Computing (e.g. High Performance Computing) is a dynamic opportunity as it grows in both traditional simulation, and lab/research environments as well outside of traditional HPC markets as these technologies become more accessible to other industrial markets such as Cloud, and other Big Data application needs. The emerging Exascale needs will require a new approach to handling the performance and scale requirements that are anticipated. For example the Square Kilometre Radio Telescope Array will write 1Exabyte per day. That is more than 10 TB / sec sustained! Presently that requires 100,000 disks, which is considered to be close to unmanageable. Just scaling up won't resolve the issue, we’ll need to be smarter with more data management. Arkema, being the French Chemical Industry leader, provides innovative solutions to other industries on a worldwide basis. Arkema innovative strategy focuses on sustainable development in fields such as new energy, biobased raw materials, energy storage or lightweight materials. Numerical modelling enables Arkema to shorten innovation cycle time and to bring enhanced customer service. It is used at several scales, starting from microscopic approach, to predict physical properties and thermodynamic behaviour of new species, reaching the mesoscopic scale to optimize pilot steps and finally going to macroscopic approach to virtually design new materials or processes. The complexity of the physical and chemical process taking place in the chemical industry (non Newtonian fluids, composite materials, interfacial phenomena, reactive media and multiphase media) limits the accuracy of the current numerical simulations. Access to significant CPU resources becomes a major challenge to perform predictive modelling. The present lecture illustrates practical usage of numerical modelling in domains such as in-line polymerization process control, new polymeric materials eco-design or hydrodynamics modelling in stirring vessels. The point of view of a chemical company with respect to the remaining challenges and perspectives in the field of numerical modelling will be then discussed.